The board of IATCB is proud and excited to announce a new division for the organization, in addition to being known as the International Avian Trainers Certification Board, we are now also the International Animal Trainers Certification Board. Under the umbrella of this new section of IATCB we have been working hard with our partners, AAZK and ABMA, and also IMATA to develop the Certified Professional Animal Trainer - Knowledge Assessed (CPAT-KA) examination. Shortly you will see updates to our web site with information about the new certification together with the Candidate Handbook and dates for the first testing cycle. Once again Professional Testing Corporation will administer the testing, stay tuned for the official launch soon after the board meets at the Nashville Zoo this month to review and approve the examination. We want you! We would love to highlight you or your facility in our newsletter and on our Facebook page. Contact us by email for more information. Just a reminder about some of our Limitations on CEU Credits. Multi-speaker learning events lasting more than three (3) days in length will not be granted more than 30 CEUs. Single-speaker learning events regardless of length will not be granted more than 20 CEUs. Do you have a cool training video or conservation message that you would like to feature in our Newsletter and on our Facebook Page? If so send us the clip and a link and we will post it for you! Don’t forget to share it with all your friends! Check out Nikki Odoriso, CPBT-KA, at Monterey Bay Aquarium as she was featured by BBC Earth! Way to go Nikki, such a powerful message! The Pileated woodpecker (Dryocopus pileatus) is a permanent resident of deciduous or coniferous forests in southern Canada and in the western, midwestern, and eastern United States. This is the largest woodpecker found in most of North America. It is best recognized by its mostly black with white stripes on the face and neck and a flaming-red crest. Males have a red stripe on the cheek. aries Because of its size and chisel-shaped bill, this woodpecker is particularly adept at excavating, and it uses this ability to construct nests and roost cavities and to find food. Adapted primarily for climbing on vertical surfaces; occasionally hops on the ground. Awkward on small branches and vines when reaching for fruit. 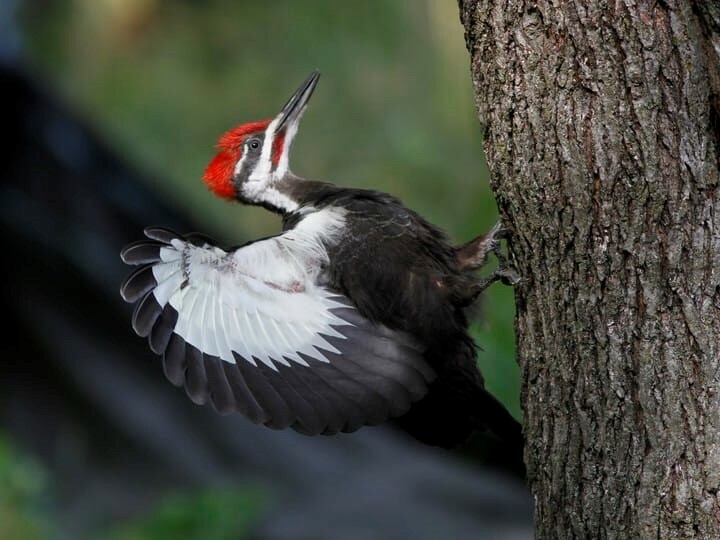 As a large, non-migratory insectivore, the pileated woodpecker may provide an important role in controlling insect outbreaks, particularly those of tree beetles. Also, this woodpecker may be a keystone species because its nest excavations provide habitat for many other species. IUCN list them as a Least Concern. This species has an extremely large range, and hence does not approach the thresholds for Vulnerable under the range size criterion.